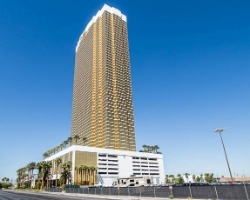 *Hilton Grand Vacations Club at Trump International Hotel Las Vegas* provides a one-of-a-kind experience, surrounded by the glitz and excitement of Las Vegas. This 64-story resort features stunningly appointed studio, 1- and 2- bedroom suites. All units have whirlpool tubs, studios are equipped with kitchenettes and suites offer fully equipped kitchens. Guests can enjoy the 6th floor deck with 110-foot heated pool, award-winning dining options, world-class spa, salon and fitness center and much more! For more information, please visit www.hiltongrandvacations.com. Great rental option which is based on points! Explore any resort within the HGVC network!